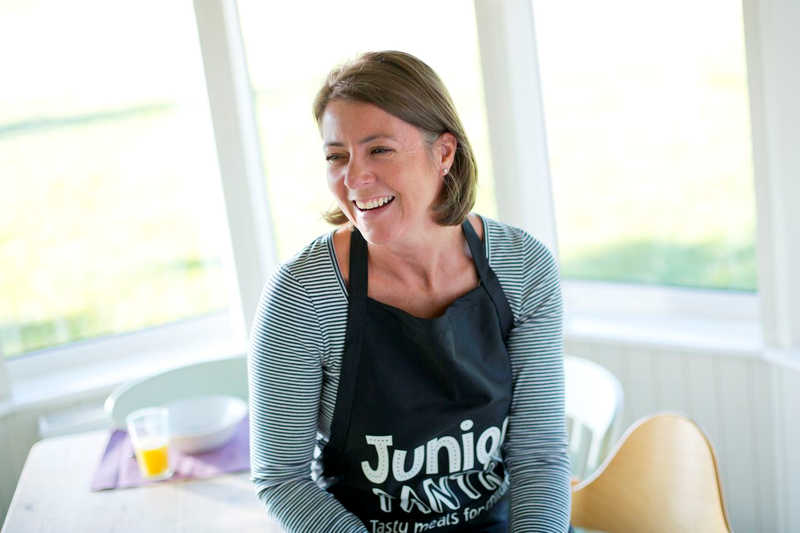 Kate Finch is the founder and owner of Juniors Pantry (http://www.juniorspantry.co.uk/). She is also a wife and mum to two girls aged eleven and nine. I went to talk to her about her business and how she balances work and family. Up until late 2010 Kate worked in the city and had done for many years. She was never a stay at home mum and employed a nanny to help with her childcare. She was comfortable with this when her children were young but as they grew older and a house move meant a long commute she became less enamoured with her work/life balance. In the autumn of 2010 Kate took the opportunity to stop working and took on a full time role at home. One of the things Kate quickly noticed was how much cooking she did. Her husband was never home to eat at the same time as their children so Kate was cooking two meals every night. Added to that was the stress of getting the kids to and from after school activities and still feeding them properly so she started to make one pot style dishes that she could feed to all the family without preparing it twice. In 2011, Kate was listening to Women’s Hour on Radio 4. They did a piece on ‘Mumpreneurs’ and one of the women featured was from Plum Baby who make baby and toddler food. It struck her that she hadn’t seen anything similar targeted at older children and after some research she realised that this was an untapped market. She pitched the idea to her husband the next morning and Juniors Pantry was born. Kate had never planned to work for herself, she thought she would be a corporate junkie forever, but once the idea took root she gave herself a year to get a product onto the shelf. She likens the first year to living in fear, terrified every time she went to the supermarket that someone would have beaten her to it. They didn’t and within that year she had a product on sale. 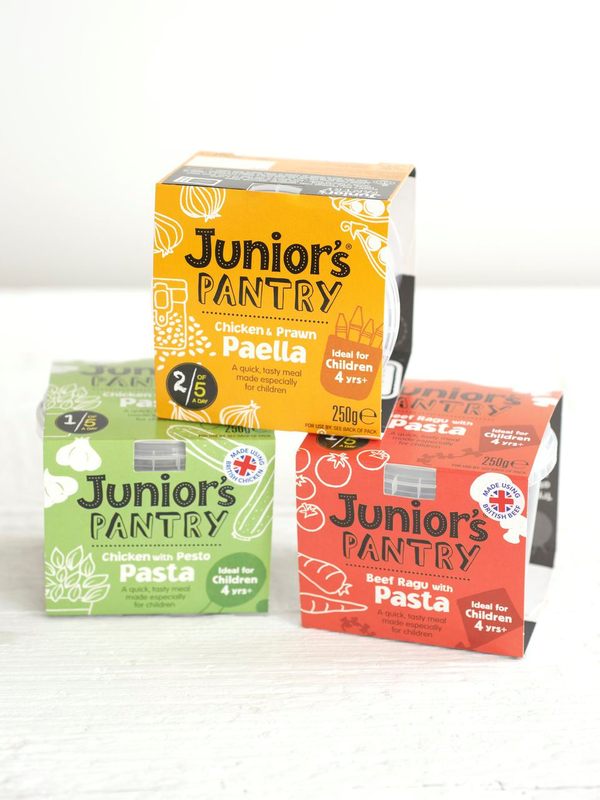 Juniors Pantry makes one pot, healthy meals for children aged four years and older. These meals are made as they would be at home with no additives and they all include a portion of vegetables. Kate sees it as grown up kid’s food. She doesn’t make traditional nursery food such as shepherd’s pie or fish fingers. Her meals are more sophisticated and encourage your child to experience new tastes such as Kedgeree and Paella. Currently they’re sold through Ocado and Waitrose launched them last week in their chiller cabinets. Kate sees a balanced diet as imperative to her children’s wellbeing. They are very active physically and she always makes sure they have a good breakfast. She has taught them to understand different food groups and they will actively seek a protein and a vegetable when selecting what they want to eat for lunch at school. She has sold them healthy eating as something that will make them fit and strong and allow them to participate in all the sports that they love. She never talks about weight or size. I asked Kate if she felt her life had more balance now she worked for herself. Her answer was unequivocally yes. She structures her day so that can do the school run and always plans around the kids school functions and sports matches so that she can attend. Her girls see Juniors Pantry as an integral part of their home life and last week stuck 15,000 ‘Made in Britain’ stickers on 15,000 pots. The message she is teaching them is clear, being a wife and mum does not preclude being a successful career woman. You just have to adapt. Going forward Juniors Pantry has expansion plans including other supermarkets, healthy breakfast cereal and lunchbox snacks as well as new one pot meals. Kate’s advice to others thinking of taking the plunge into their own business is simple. If you are going to give up a job to do it think very carefully first, things will always take longer and cost more than you think they will. If you’re not working then go for it, what do you have to lose? She also thinks you need to really want it. If the thought of someone having the same idea and making a success of it hurts you then get on and do it but be prepared to make sacrifices and make sure your family is prepared for that too. Kate was a pleasure to talk to, she’s passionate about her product and lives her ethos. It’s karate night in my household this evening and that usually means a frozen pizza as we’re in a rush when we get home. Not tonight! Today I’m going to pop into Waitrose and I’ll be serving Juniors Pantry for dinner, I might even have one too!